Byron Carter, along with his father Squire and uncle Charles, had numerous businesses in Jackson at 204 W. Cortland. It was the bicycle sales and repair shop at this location that was the primary location of his friction-drive experiments and the creation of his first friction-drive car. Before the Motorcar Company was incorporated in 1905, Byron Carter built at least 11 different friction drive cars in Jackson. This building no longer exists. If the story in the first catalog of the Motorcar company is to be believed, "a party of Detroit gentlemen... visited Jackson, and, after a most searching investigation, arranged to move Mr Carter and his business to Detroit, where it might be quickly expanded and developed." The Motorcar Company occupied the former Stearns "laboratory." This building no longer exists; it was located about where the Michigan Welcome Center close to the Ambassador Bridge is now located. More information and pictures for the Detroit factory can be found here. 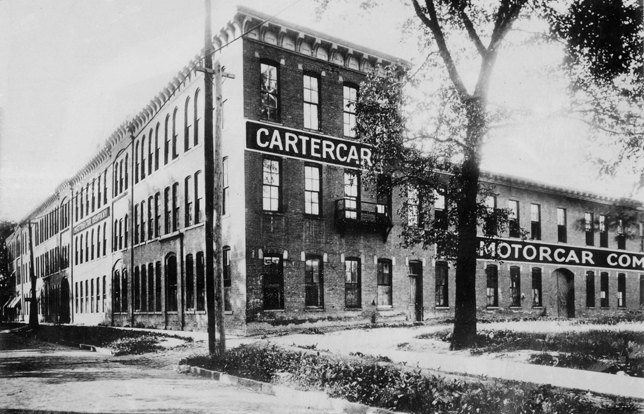 After the death of Byron Carter in 1908, the company name was changed from the Motorcar Company to the Cartercar Company and was relocated to the larger plant of the Pontiac Spring & Wagon Works. One of the original buildings at the Pontiac site is still in existence and is being used as a warehouse. More information and pictures for the Pontiac factory can be found here.